You're looking for a new car but you're tired of the same old sedan or hatchback look. Stop looking at the old standards and start looking at the 2017 Hyundai Veloster. With the perfect mixture of style and function, the Veloster will have heads turning. When you first see a Veloster, it stands out. This vehicle looks like the stylish offspring of a sports car and a luxury SUV. The aerodynamic windshield and slightly sloped back end with chiseled looking side panels give it a futuristic vibe.The stealth 3rd door gives you the look and style of a coupe with the extra ease and function. The dual, centered, chrome tipped exhaust hides everything but the end of the tail pipe, adding to the sleek modern look. As you get into the Veloster, you'll notice the dash-mounted 7" touch screen. This can be used for the integrated GPS, voice command system, climate control, or even the apps on your phone. Apple Car Play and Android Auto let you connect your phone to the touch screen and, from there, play your playlists, send or receive text messages (hands free), listen to your podcasts, or even ask Siri. The tech you won't see stepping in is Hyundai BlueLink. BlueLink, which can be accessed through your smart watch, will give you a monthly report on your car and anything that needs to be checked out, offer you remote unlocking (no more locking your keys in the car! ), or start the A/C before you get there on a hot summer day. Another thing the Veloster provides that everyone wants is great gas mileage. The Veloster comes with 27 city mpg and 34 highway mpg, which will save you an average of $1,000 dollars in fuel costs when compared to the average new car. The great thing about driving the Veloster, other than the gas mileage, is the optional paddle shift controls. The paddles, located right by the steering wheel, give you the option of manually changing gears to give you the fun and control of a standard transmission without the learning curve or stalling. On top of its stunning good looks, cutting edge connectivity, and more, the Hyundai Veloster comes with America's Best Warranty. 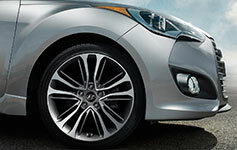 The Hyundai new car warranty covers you for 5 years or 60,000 miles. If you're looking at the powertrain warranty though, you're covered for 10 years or 100,000 miles. That's more than 60% longer that most other makes will cover their cars-and that says something. If you want to take the look of the Veloster even farther, the Turbo is for you. The wide-mouthed grill provides for an even more striking color contrast when you're looking head on. The side blade accents along the bottom provides even more drama as you pass by. With these, plus side view mounted turn signals and a two toned interior, you'll be sure to be noticed. 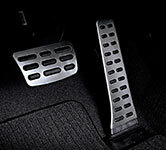 Take the power back with the manual transmission option, which allows you to amp up the sporty nature of the Veloster. In the Veloster, style goes all the way to the floor boards. Sporty style extends all the way to the wheels, which amps up the impressive exterior. Stand out from the crowd with an interior with its own personality. If you want the same boring car that everyone else has, go for it. You'll find plenty of options that are more safe than stylish. But if you want something different, that will stand out, that people will notice, but that isn't so expensive that you'll have to live in it, then you need the 2017 Hyundai Veloster.